If I don’t get a grip this will turn into a recipe blog. Fear not, the usual abnormal and bonkers service will resume tomorrow but today I have been tweaking my apron strings. It is that time of year, all good downshifters are filling their larders with jars and bottles. The harvest is astonishing. One of my apple trees has fallen the weight of the fruit was so much. I think we can rescue it, but as it is only 10 years old it doesn’t have the great root base it needs for its gargantuan harvest this year. The plums and damsons are almost ready, the crab apples are starting to blush and the quinces are fantabulous. This is a super jelly year. I collected about 6lb of brambles and made up the juice before the weekend so I had to make the jelly today. Oh the deep richness and intense flavour of bramble jelly is so exquisite. The hedgerows are still offering up more so I shall pick some tomorrow for jam. However today I was determined to use up the last of the beans. They have been hugely successful this year. I planted them in the “three sisters” format. Beans, sweetcorn and squash and all three are thriving. I am going to expand to fill the whole raised bed next year. Back to the beans. I don’t usually like piccalilli but the Boss loves it. We have come to a compromise. Valentine Warner’s bean chutney. 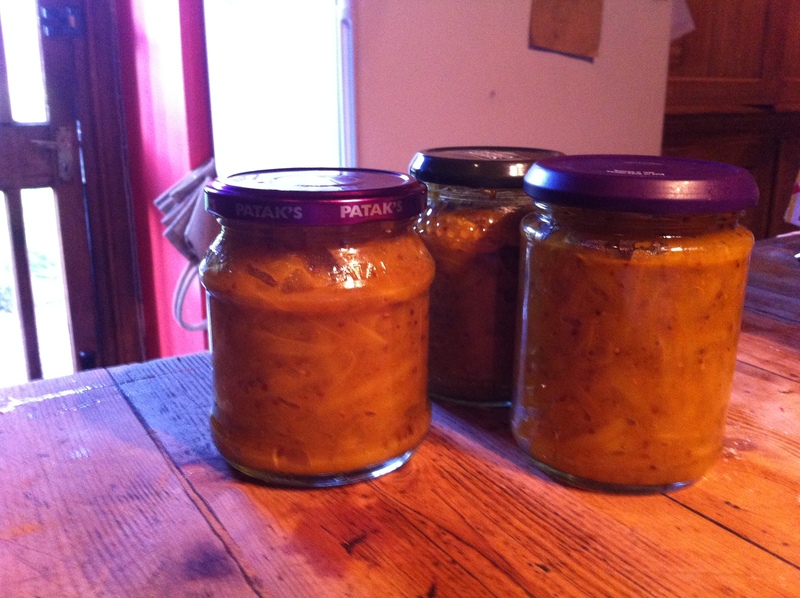 It isn’t like any chutney I know, it is a delicious sweet, mustardy beany piccalilli and I love it. Peel and chop the onions into a small dice. Tip into a large, heavy-based saucepan and pour over the malt vinegar. Bring to a gentle simmer, cover loosely and cook for 15 minutes until softened, stirring once or twice. While the onions are cooking you can prepare the beans. Trim the ends, then cut down each side to remove any strings. Place each bean flat on the board and slice thinly lengthways on a long diagonal into 7 or 8 strips. How many slices you end up with will depend on the size of each bean. Ignore any that have plump little beans hiding within, as they will be the toughest. Plunge the beans into a large pan of boiling water and return to the boil. Cook for 3 minutes, then drain in a colander and refresh under cold water. Drain. 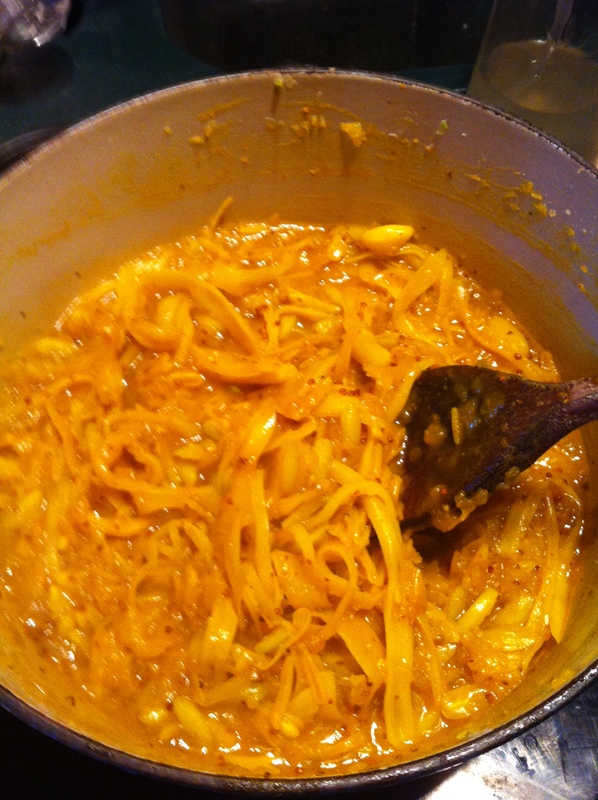 Mix the mustard powder, turmeric, cornflour and 4 tablespoons of the white wine vinegar until smooth. When the onions are ready, stir in the sugar and remaining white wine vinegar. Bring to the boil and cook for 2 minutes. Add the beans and simmer gently for 10 minutes, stirring occasionally. Stir the cornflour mixture until smooth once more and then pour slowly into the onions and beans, stirring vigorously to dispel any lumps, followed by the wholegrain mustard and salt. It will look a bit like this and smell of heaven. Gently simmer the vegetables, mustard and spices for 20 minutes, stirring regularly so that the chutney does not stick to the bottom of the pan and burn. Pot the chutney into warm, sterilised jars and leave to cool. Cover, seal and store in cool dark place for at least a month. If you can leave it for a month you are stronger than I!